I love serving timbales as starters. They look pretty, and they are easy to make and not temperamental like soufflés. All you have to master is the flipping over of the hot ramekins. 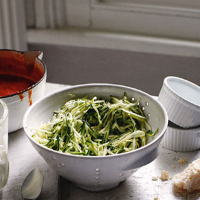 Sprinkle the courgettes with the sea salt and leave in a colander in the sink for 30 minutes. Rinse, tip into a tea towel and squeeze out as much water as possible. To make the tomato sauce, heat the oil in a casserole, add the garlic; cook for 30 seconds. Add the tomatoes; season. Cook on a medium heat for 30 minutes, uncovered; stir regularly as the sauce thickens. Set aside. Preheat the oven to 180˚C/gas 4. In a bowl, beat the eggs with the crème fraîche. Add the parmesan, salad onions, mint and courgettes; season and stir. Oil six 100ml ramekins; cut a disc of baking paper to put in the base of each. Put them in a roasting tin and fill each with the mixture; fill the tin with hot water to come halfway up the ramekins’ sides. Bake for 30 minutes, until golden. Add the mint to the sauce; heat. Lift the ramekins out of the tin, run a knife around the rim of each and flip them out onto plates; serve with the hot tomato sauce. The aromatic flavours would suit this racy white. Domaine Ventenac Chenin/Colombard 2008 Vin de Pays d’Oc, South of France. Bin 402014; £6.99.